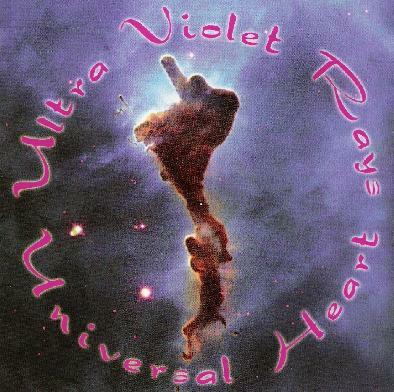 Ultra Violet Rays - "Universal Heart"
Ultra Violet Rays are finally back with the follow up to their 2000 debut, Den of Desire. Musically, Universal Heart is completely in line with Den of Desire… a style of progressive rock that is similar to the early 1980s British Neo-Prog bands like IQ, Pendragon, Pallas and the like. In terms of classic prog styles this is a bit refreshing to my ears, and of course just reflects a personal preference, but so much of the progressive rock submissions I receive these days have fallen into a very generic trap. That is, in terms of musicianship and compositional complexity they are anywhere from very good to incredible… yet they tend to sound very much alike, with little to set them apart from the rest. Ultra Violet Rays, though not breaking any new ground, are mining an era that I don't hear too many bands exploring much these days. The band eschews fusiony instrumental pyrotechnics in favor of thoughtful compositions and song structures, and beautiful flowing and soaring guitar and keyboard lines. And vocalist/lyricist Johnny Trey McMahan has the ideal singing style for this music. Because this review is appearing in a space rock publication I'll mention that keyboardist Steve Hayes and bassist Bill Spear are both in Secret Saucer, were both in Hawkwind tribute band Sun Machine, and Steve was also in Star Nation with Richard Chadwick and Jerry Richards. Steve makes little nods to space rock throughout the album with spacey synth colorings from time to time, which sounds especially cool combined with the mellotron sounding keys on "Melancholies Madness". Fans of classic progressive rock and the early 80s Brit bands in particular will find much to enjoy on Universal Heart. For more information and to hear music you can visit the Ultra Violet Rays Myspace page at: http://www.myspace.com/ultravioletrays.